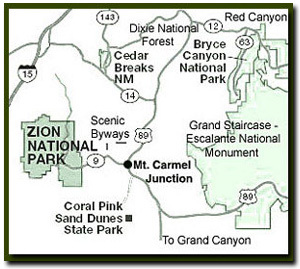 Zion National Park on one side of this 9 mile long backway and the oddities of the polygamist towns of Hildale, Utah and Colorado City, Arizona on the other make for an interesting area to explore. John Wesley Powell and Clarence Dutton explored the area in the 1800s and it was named by Powell. Views along the path include Smithsonian Butte, Canaan Mountain and of course Zion in the distance. This backway is drivable by a 2WD, but it’s impassible when wet. Located near the byway is the Ghost town of Grafton. Probably due to its proximity to Zion National Park, this small ghost town is one of the most photographed in the West. The ghost town of Wheeler was first settled in 1859 as a cotton growing project, just below Grafton. The town people moved to higher ground due to flooding of the lower area. In 1866 due to Indian influence the 28 or so families that were living in Grafton was completely abandoned it for two years. Three families remained into the 1920’s. In more recent times scenes from many movies where shot there, the most famous is probably 1968 movie: Butch Cassidy and the Sundance. Kid. For a very short time Grafton, instead of Kanab, was the county seat of Kane County. Today Grafton lies in Washington County. 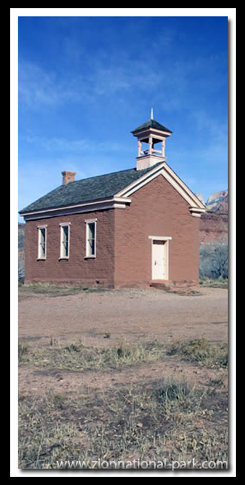 Photo: This church is one of the buildings you can see at Grafton Ghost town just out of Rockville, not far from the south entrance to Zion National Park and fun to visit before or after driving the Smithsonian Butte Backway.